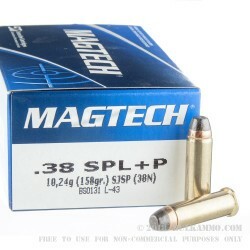 A great multi-purpose 38 special round for the guns you prefer to shoot .38 Special +P ammunition out of. 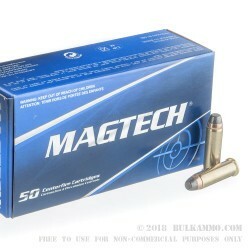 This is a 158 grain load that offer superior ballistics to the standard cartridge offerings by increasing powder load and overall pressures. This results in a more potent threat stopping round that most .38 Special revolvers can handle. This can also be shot out of a .357 Magnum revolver without concerns. Because this is a .38 Special +P load, which indicates that is an “over pressure” round, you should be certain that your firearm is capable of shooting this ammunition. To verify this, you can check your owner’s manual. Note: many ultra-lightweight and small framed revolvers are not capable of sustaining the high pressure caused by the +P rounds. 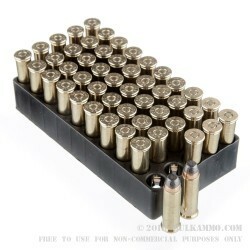 Please exercise good judgment and verify the capability of your firearm before using this ammunition. This is a load that achieves 744 feet per second velocity and 200 ft. lbs. of energy delivery which is a step up from standard loads. From a personal protection perspective this enhanced performance pairs well with the soft point semi jacketed projectile. 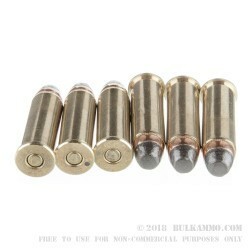 This round is suitable for use in any firearm that can handle the .38 Special +P loading.